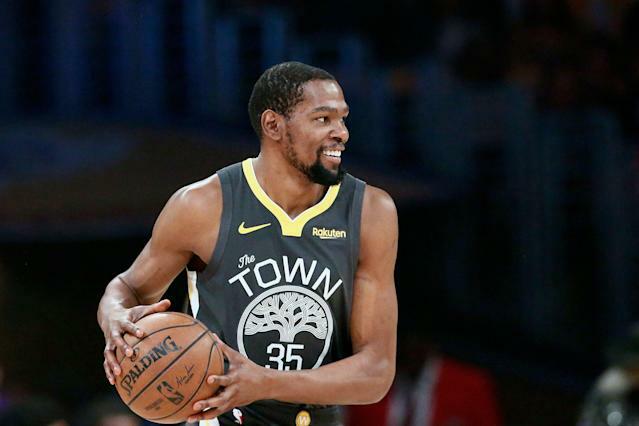 Kevin Durant and the Golden State Warriors will kick off their opening round playoff series against the Los Angeles Clippers on Saturday — marking the start of their conquest to win a third-straight NBA Finals. Naturally, Durant has been an integral part in the Warriors’ success throughout his time in the Bay Area. While that may change this offseason — Durant, along with DeMarcus Cousins and Klay Thomspon, will become free agents this summer, and many are speculating that Durant will sign with a new team — Durant opened up about his time with the Warriors this week to The Athletic. The 30-year-old was one of the most popular players in the league during his time with the Thunder. That seemingly changed overnight, though, once he jumped ship and signed with the Warriors in 2016. He said he knew he had to just take the hate. There was nothing he could do. Even though he’s garnered a lot of hatred and criticism for joining one of the best teams in the league — and creating a powerhouse franchise in the NBA — Durant doesn’t look at it as an easy decision. In fact, just the opposite. “I’m from Washington, D.C. I went to Oklahoma City for eight years. Out of nowhere, I went to the Bay for three years,” Durant told The Athletic. “I’ve been roaming my whole life. I never had no stable environment. Ever. Ever. Since I woke up. Durant has averaged 25.8 points, 7.1 rebounds and 5.4 assists in nearly three seasons with the Warriors, playing just more than 34 minutes per game. While his stats were slightly better when he was with the Oklahoma City Thunder, Durant now has two rings to his name. But it wasn’t just the prospect of winning multiple championships that drew Durant to the Warriors. It was their style of play, and what he knew it would do for his game. “I enjoy the way they played basketball. I never played with shooters like that. That moved. That were versatile players. I wanted to be a part of that,” Durant told The Athletic. “My game was talking to me. Not that other s---. The spirit of the game was talking to me. Not the spotlight or the fame that comes from being the best player. Not the legacy. I swear on my life, that don’t mean nothing to me. So, with two NBA championships after nearly three seasons, has being with the Warriors been everything Durant thought it would be? “Of course,” Durant told The Athletic.